Tony Muna has assured us for a while now that the Aggreko generators would be up and running and providing us power by September 16. 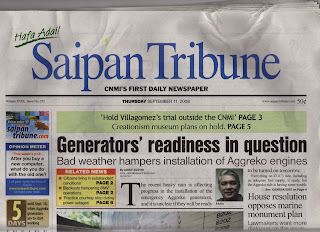 The Governor wanted PSS to postpone classes because, after all, we were going to have reliable power by September 16. Yes, that says "Bad weather hampers installation..." Bad weather? This brings the definition of "bad weather" to an all time new low. It's rained a bit, that's all. Do you think rain is unexpected at this time of year? Do you think that Tony Muna, who has lived in the CNMI most of his life, couldn't have predicted that we'd have some rain at some time during the months of August and September? So now Aggreko says they're having problems with the installation because of the "bad weather." And Tony Muna has kindly passed that word on to us, so we can know that it's seeming a bit questionable that Aggreko and CUC will meet the promise of September 16. I can hear Tony singing "Don't Rain on My Parade," only he's a bit out of tune. I'm getting the hang of this: the next reason for outages will be brown tree snakes-- it worked for years on Guam. Blame it on the Legislature for not signing a blank check budget and, of course, the snake hunters have been diverted to repel PEW commandos trying to sneak ashore. KAP said "...the snake hunters have been diverted to repel Pew commandos trying to sneak ashore."